The Su-7, given the NATO reporting name 'Fitter-A,' was originally intended as a fighter to counter NATO's F-100 Super Sabre and F-101 Voodoo fighters, in service with the USAF. It was armed with two NR-30 30 mm cannon in the wing roots, with 70 rounds per gun. In keeping with the vogue for unguided rocket armament, early models had provision for an under-fuselage rocket pack, but this was quickly abandoned. The Su-7 entered service in 1958, but in 1959 it was decided, that a basic Soviet fighter would be MiG-21, and a production of Su-7 fighters was canceled after building less than 200 machines. As the Su-7B, the 'Fitter' soon found its metier as a ground-attack fighter-bomber, entering frontline service in 1961. In the Soviet service, its primary purpose became carrying of tactical nuclear weapons. The Su-7's combat capabilities were limited. With a tiny internal fuel volume of 2,940 l (647 imp gal), its operational radius, even with drop tanks, was poor - seldom more than about 300 km (200 miles), and it had almost no useful range at all with maximum ordnance. Take-off and landing speeds were also very high, requiring long runways. Su-7BKLs had provision for JATO, but this only made logistics even more complicated, so it was rarely used. An additional problem with early models was that the afterburner took six to seven seconds to light, a handicap in combat. In its favor, the 'Fitter' was very easy to fly, with docile handling characteristics. Its controls were notoriously heavy, but it was forgiving and predictable. The thirsty engine provided exceptional rate of climb and low-level speed. Furthermore, the entire aircraft was extraordinarily tough and robust, easy to service and cheap to operate (except in fuel consumption). Despite its limitations, it was popular with pilots. The Su-7 saw combat service in the Six Day War in 1967, the War of Attrition, and conflicts between India and Pakistan. Although used mostly in the ground attack role, an Indian Air Force Su-7 did shoot down a Pakistani Shenyang F-6 (Chinese copy of the MiG-19) in 1971. The limitations of the Su-7, particularly in take-off distance, led the Soviets to pursue the swing-wing Su-17, but the Su-7 remained in service through the 1980s. It was exported in the thousands to some Soviet Bloc and Warsaw Pact nations as well as many other air forces. In addition to the USSR, users were: Afghanistan (about 120), Algeria, Czechoslovakia (about 60), Egypt, India (about 160), Iraq, North Korea, Poland (46), South Yemen, and Syria, possibly Bangladesh. A two-seat trainer was also built, the Su-7U (NATO 'Moujik'), and an export variant the Su-7UMK. The two-seater removes the leading fuselage tank, reducing fuel capacity by some 200 kg (440 lb), but is otherwise combat-capable. Visibility from the rear seat was poor so had to be augmented with a mirror system to allow the back seat instructor at least some modicum of forward visibility during landing. Molded in a light grey plastic, the detailing is engraved and quite nicely done. Some might think it a bit overdone for this scale, but really, they couldn't do it much lighter and still have it present. 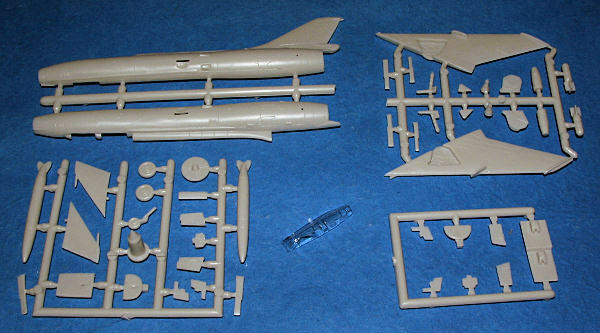 Many parts that would normally be several pieces are one-piece in this scale, and that includes wings, tail planes and drop tanks among them. The nose wheel and gear leg are in one section and some of the gear doors are combined. There is detail in the wheel wells, which is nice. One could replace the gear doors with sheet brass for a more scale thickness. You could also build this gear up as most of the doors will need to be cut prior to use. I found some sink areas but all were on the back side of things so won't be seen. The kit includes side panels for the cockpits and instrument panels with some detail on them. No control sticks or rudder pedals so you'll have to make those. Frankly, you won't see much through the very thick but surprisingly clear transparency. Ordnance includes bombs and rocket pods as well as the aforementioned drop tanks. Really, the drop tanks are a given on the centerline of this fuel-sucking monster so you have a choice for the wing pylons. The instructions show you exactly where on the pylons to fit these, a nice touch. Instructions are somewhat basic, but more than adequate. You have a parts guide, five construction steps and a painting/decal guide for five aircraft. Humbrol and generic color names are provided. Three options are unpainted metal for Poland, Czechoslovakia and India. 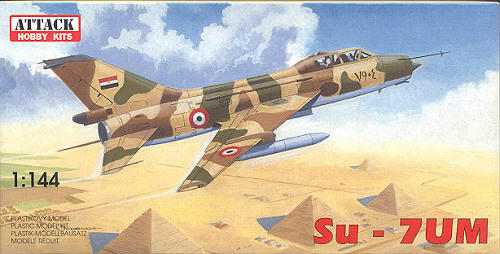 Camouflage aircraft as are on the box art are for Russia and Egypt. The decals are very nicely done and I was quite pleased with how well they worked on the MiG-17 I built earlier. This sheet is superbly printed and I noticed no registration situations. One thing about most Russian two seat tactical trainers of the time is that they could not be called beautiful. However, as homely as they are, they are interesting looking and add a lot to a collection. I think you'll find this one to be a nice build. My Thanks to http://hobbyshop.cz for the review samples. Get yours on-line at the link to the left. If you would like your product reviewed fairly and fairly quickly by a site that has nearly 325,000 visitors a month, please contact me or see other details in the Note to Contributors.